Canine Distemper Vaccination. Dog Distemper Shots. Canine Distemper. Distemper is a common, highly contagious and often fatal disease found in dogs, wolves, coyotes, raccoons, skunks, mink and ferrets. The disease is most often seen in young, unvaccinated dogs, as well as older dogs who have not been vaccinated regularly. The period between exposure to the virus and symptoms is approximately five to nine days. Symptoms of distemper are extremely variable. All of the symptoms or any combination of symptoms may be present. Usually the first signs of the disease are fever, no appetite, fatigue, and vomiting. These symptoms are usually followed by diarrhea, coughing, thick yellow-green discharge from the nose and eyes, and pneumonia. Eventually the dog may develop convulsions. Treatment for distemper is mediocre at best. There is no known medication that destroys the virus. The treatment is aimed at preventing secondary infections and keeping the dog warm and hydrated. Antibiotics are usually given for pneumonia and diarrhea. If the dog manages to recover from distemper, he or she is often left with permanent neurological problems. Vaccinations against distemper should begin at six to eight weeks of age. 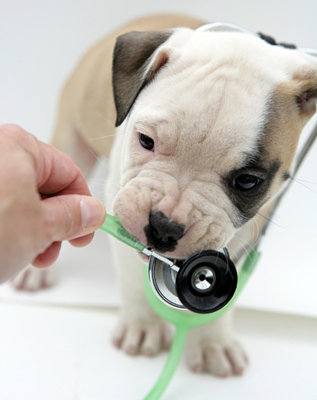 Repeat vaccinations should be administered every three to four weeks until the puppy is 16 weeks old. Regular booster vaccinations are strongly recommended to ensure proper immunity. Vaccinating your dog against distemper is safe, effective and inexpensive. Call your veterinary hospital to arrange a vaccination appointment.